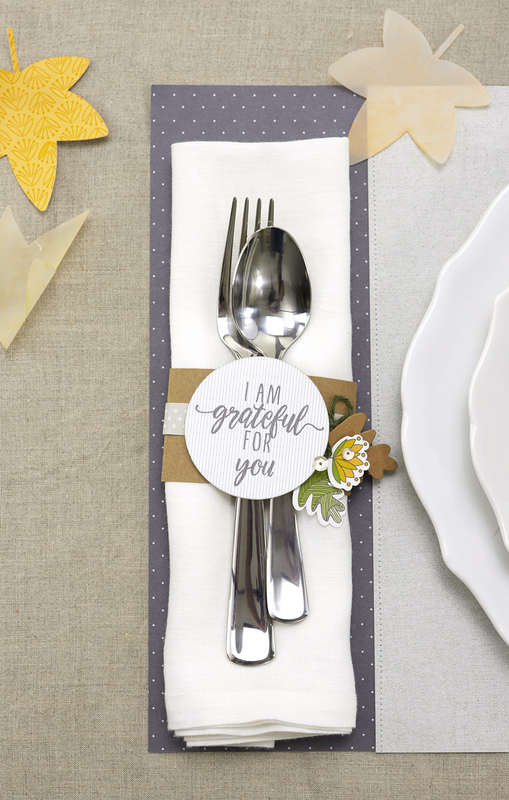 5 Quick Ways to Dress Up Your Thanksgiving Table! Who has the time to think of a place setting? We do! And we want to share with you how quickly you can put together a few pieces using our Basics Fundamental paper collection that will leave your guests feeling like you’ve been planning this for weeks! 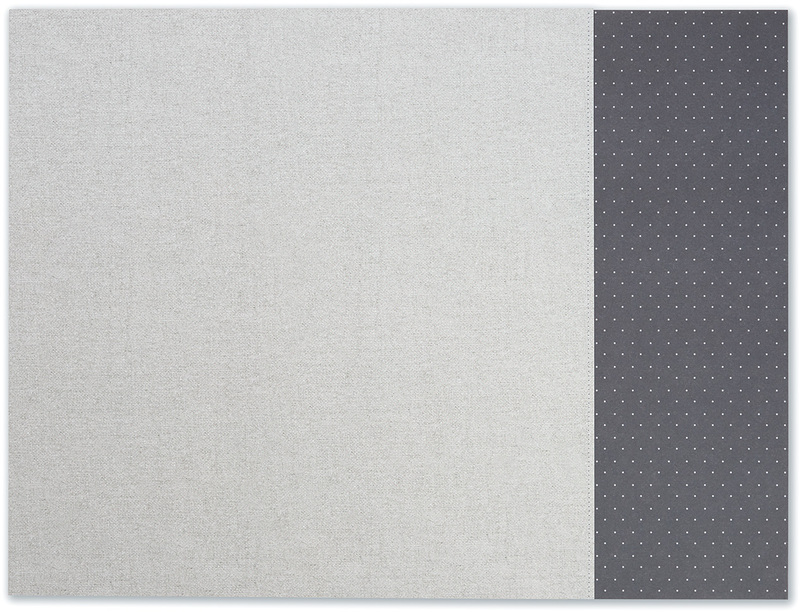 The very first thing that will go on your table (after a tablecloth, if that’s your thing) is a placemat. 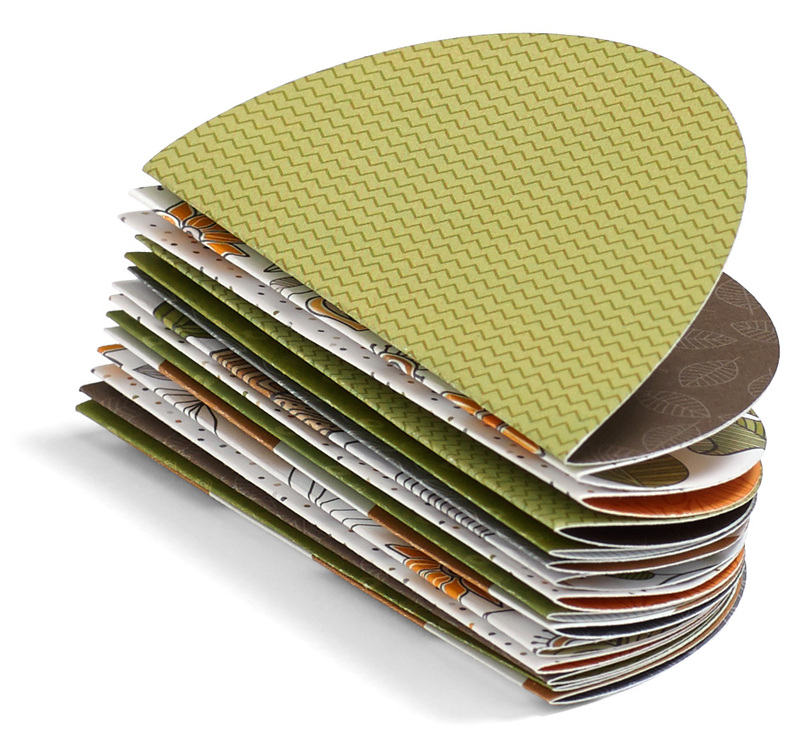 Make a 12″ x 16″ placemat by sewing a 4½” x 12″ piece of coordinating paper to one of our 12″ x 12″ paper sheets. Use the extra ½” to overlap in the back for attaching. Let your guests know where to sit with a personalized name place pumpkin! This little gourd is easier to make than it looks. First, cut 12 kidney shaped pieces of the same size from the paper of your choice. 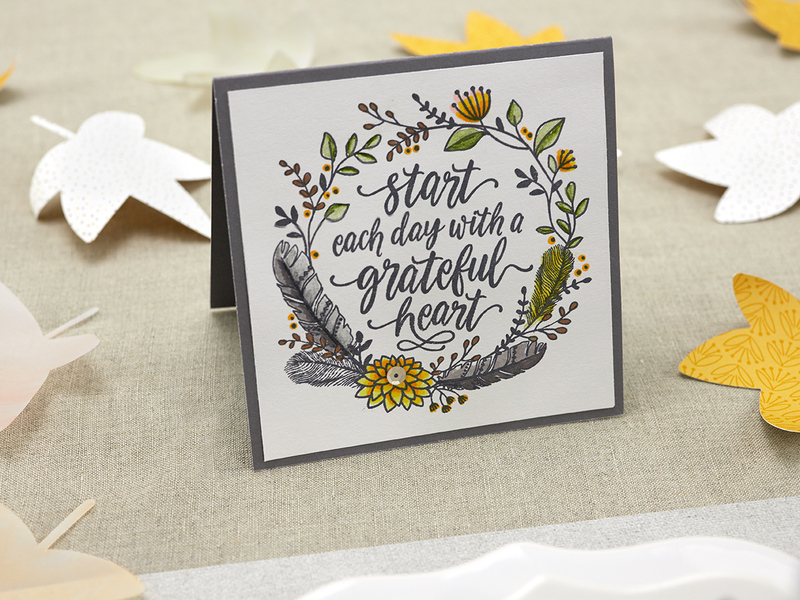 We created our own template and cut each piece by hand, each measuring approximately 3″ x 4½” (there are also plenty of Cricut® shapes that will fit the bill). Then, score each piece down the middle and start gluing them together, aligning the round edges and leaving the scored part exposed, creating a “book” of sorts. Once all of your pieces are stacked and glued to each other, attach a small straw or dowel to the “binding” and wrap the pumpkin around it, gluing the top and bottom of your stack together, creating the pumpkin shape. Add some embellishments to the top, including your guest’s name, and you’re done! Next, you will need a napkin band. 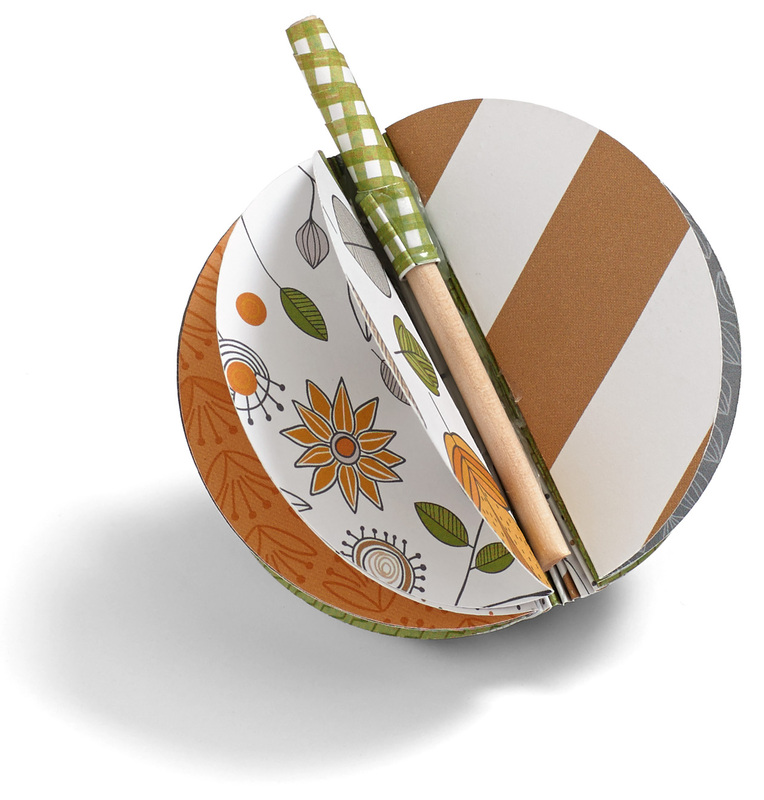 Wrap some Kraft paper around your napkin and utensils to see how big of a piece you will need for your setting. For ours, we used a 2″ x 9″ piece that overlapped about 2″ in the back for easy securing with glue dots. We added a zip strip around the middle before attaching a 2½” circle with a thoughtful stamped sentiment for the guest. (Earn some extra brownie points here by making each sentiment unique to the person reading it!). At this point you can either leave your band as is, for that “minimalist” look, or add some embellishments. Complete your guest’s dining experience with a few final touches. 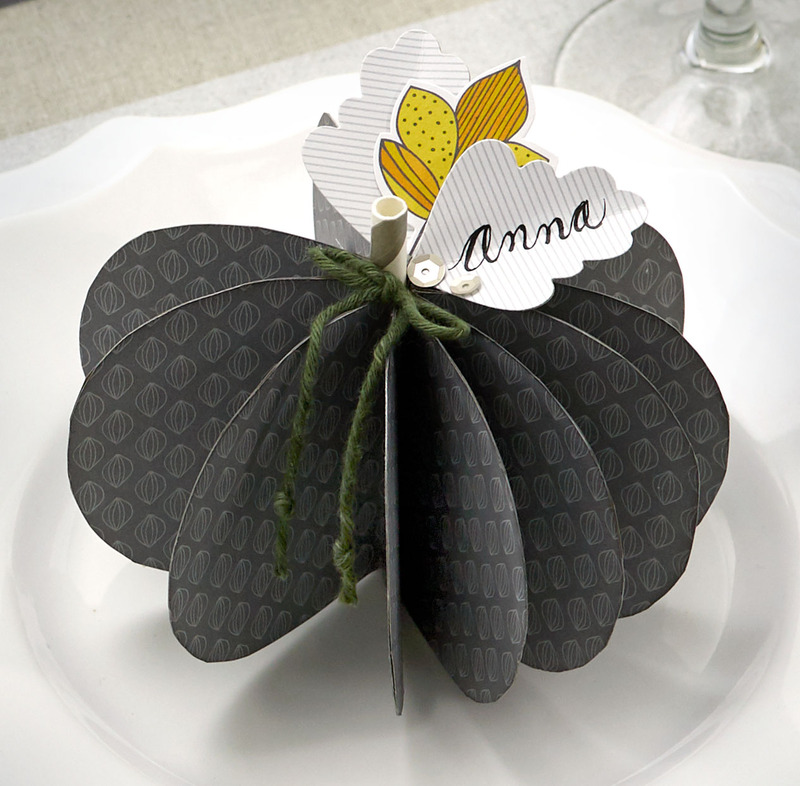 Using our trusty Cricut® You Are Here Collection, we cut up a bunch of these 3½” leaves from silver foil, vellum, and patterned paper. 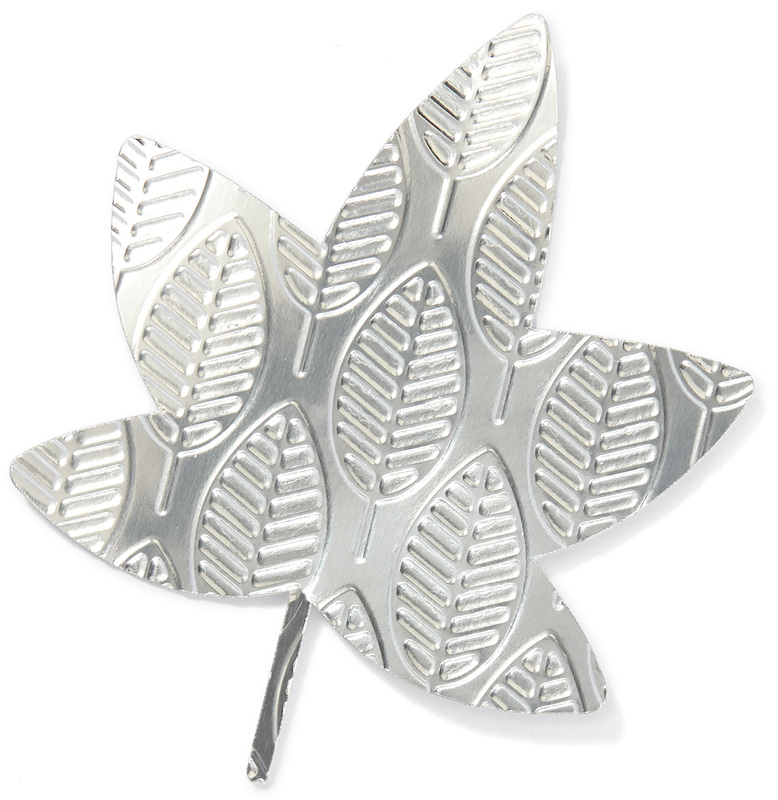 Before cutting the foil, we embossed it with our leaves embossing folder to add some textured details. 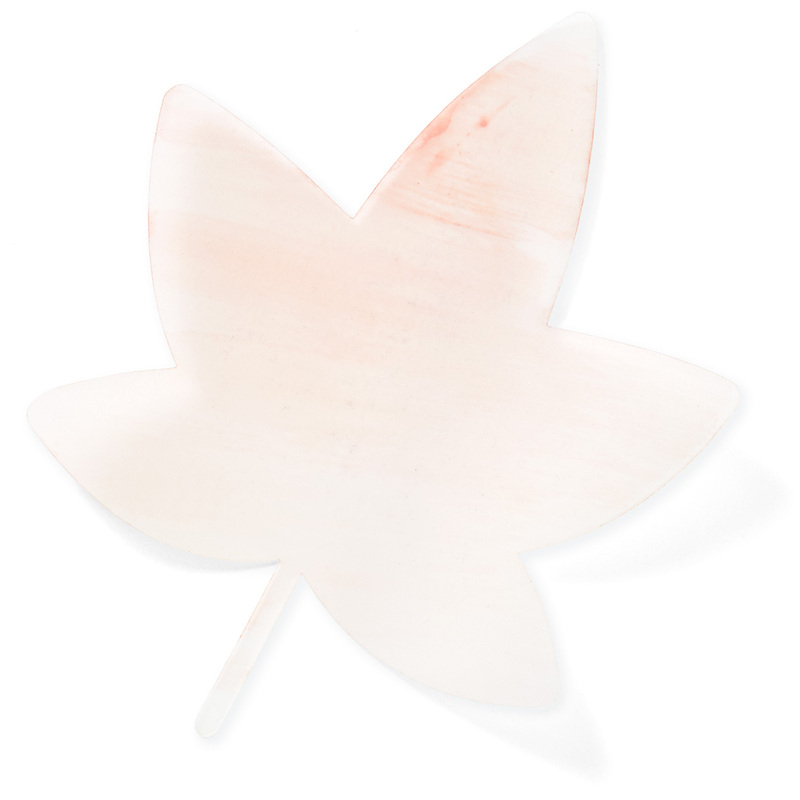 And to add a touch of color to our vellum leaves, we simple used a waterbrush with some watercolor paints. 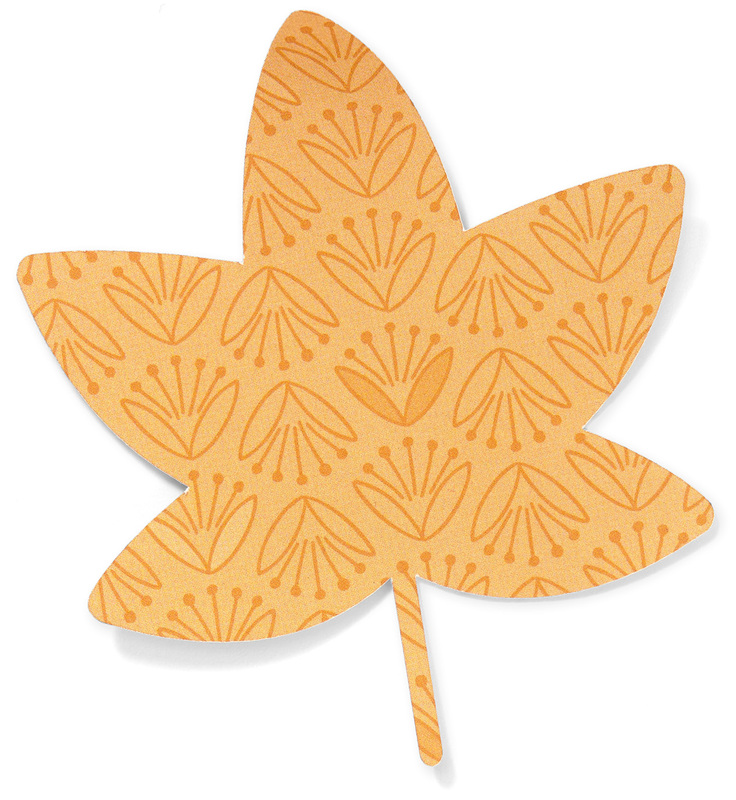 Before you’re ready to scatter these leaves, curl them slightly by wrapping them around your finger or another rounded edge. Make a card for your guests and write a message inside thanking them for coming to your home. Or, use this card as an opportunity for everyone at the table to consider what they are grateful for and have them write it down inside. There you have it! 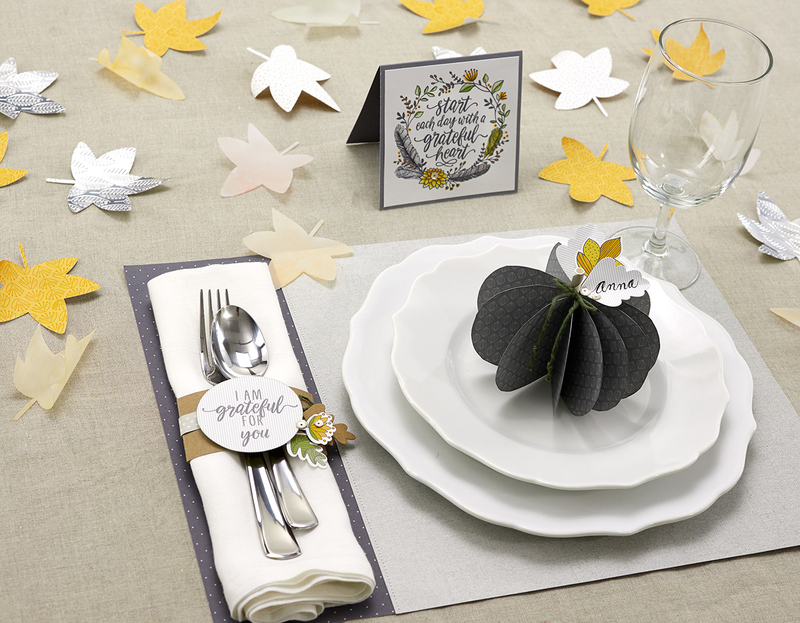 Five quick ways to dress up your Thanksgiving table! The holidays can be stressful when trying to make everything look and taste just right. We hope you take a few of these ideas and make them your own, taking some of that stress away and allowing you to enjoy the reason for the season a little bit more.